This post is my contribution to an internet event hosted by two wonderful blogs, Ferdy on Films and the Self-Styled Siren. Last year the two collaborated on their first film-preservation blogathon, For the Love of Film. This year, they are focusing in on Film Noir. This dark (in more ways than one) film genre features paranoid heroes, shady ladies, and fateful drama. Funds donated by clicking on this link (you KNOW you need to do it!) will go to the Film Noir Foundation. 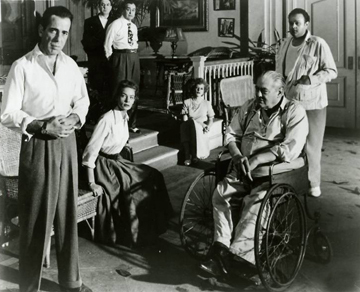 Donors are eligible for prizes, but the real prize is getting to help restore the 1950 film The Sound of Fury—and to read all the great posts the blogathon is attracting. 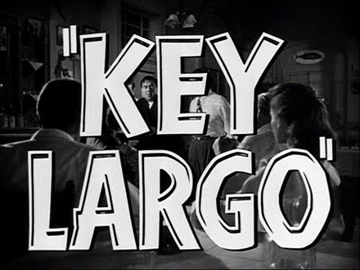 When Ferdy and the Siren announced that they were devoting this year’s blogathon to Film Noir, I wasn’t sure whether I’d be able to come up with a film to write about. To be frank, I’m not a noir girl. As a sometime intellectual I appreciate films noirs aesthetically, but as an eternal movie fan I like to identify with characters in films, particularly female characters. 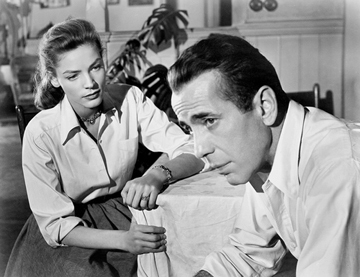 Most noir female protagonists, while interesting, are hard to identify with. They’re too busy being femmes fatales, often literally. And then I remembered Norma Desmond, who taught me a lot about the way we relate to films—and about the aging process. 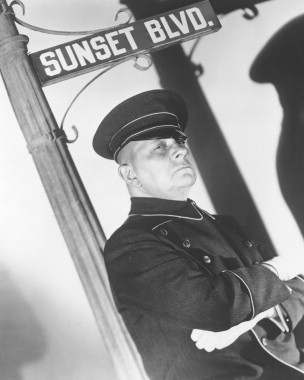 Norma Desmond is the iconic heroine (I see her as a heroine, anyway) of Billy Wilder’s 1950 film Sunset Boulevard. 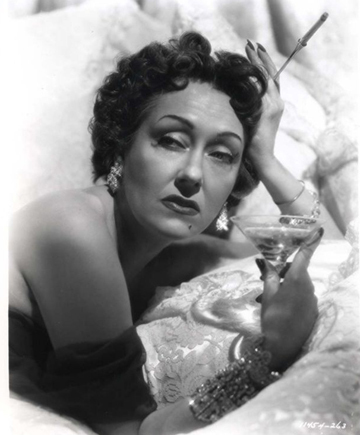 Played with studied camp and seemingly effortless glamour by Gloria Swanson, Norma is a relic of a recent (in 1950) but almost forgotten (also in 1950) facet of Hollywood’s history, the silent-film industry. 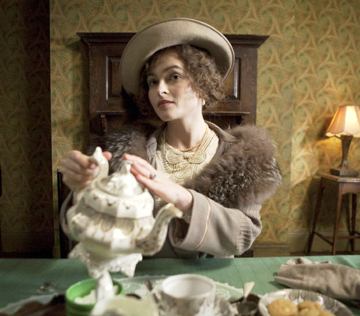 When sound film came along, many performers’ careers were finished. 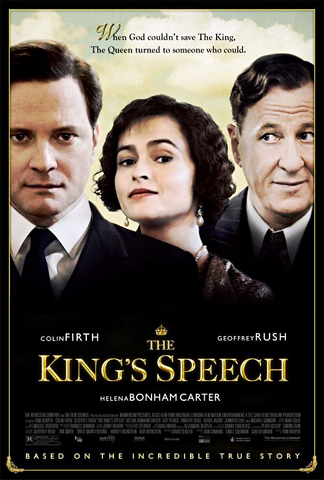 And so it was that the premise of the film–that a woman of 50 who had been an enormous star 20 years earlier was now almost forgotten–could be believable. 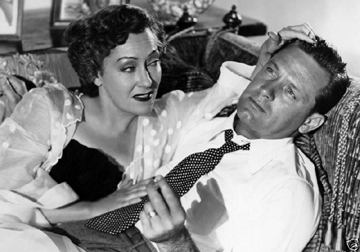 Wilder took advantage of that believability by casting several silent-film greats as Norma Desmond’s bridge-playing cohorts; the film’s younger, irreverent narrator, Joe Gillis (William Holden), refers to them as her “Wax Works.” Swanson herself hadn’t been in a successful film in many years, although she had kept busy on the stage. Norma Desmond deals with her exile from stardom by denying it, by trying to live as much as possible in the past. She fastens on to Joe, an out-of-work screenwriter, as a possible vehicle for her comeback (she actually prefers the word “return”). She hires Joe to revamp the script she hopes will re-launch her career and soon turns him into a kept man ensconced in her fading old mansion. Joe grows more and more resentful, and Norma grows more and more delusional. Norma’s final murder of Joe is no surprise since it is previewed in the film’s opening shots. 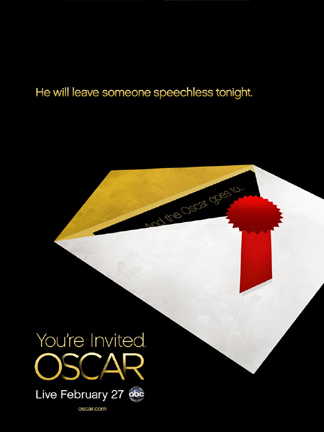 Nevertheless, Wilder managed to make the film’s ending sad, haunting, and more than a little scary. 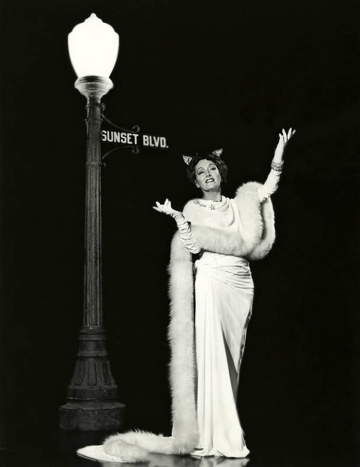 When I first saw Sunset Boulevard I was about 20. 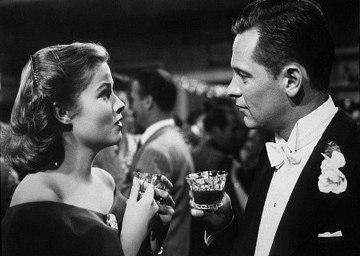 I already had a major crush on William Holden and tended to see the film through his character’s eyes. 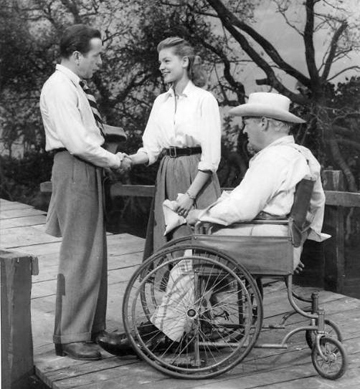 To the young me Norma Desmond was a frightening old witch, and I rooted for Joe Gillis to end up with the more age-appropriate Betty Schaefer (Nancy Olson). 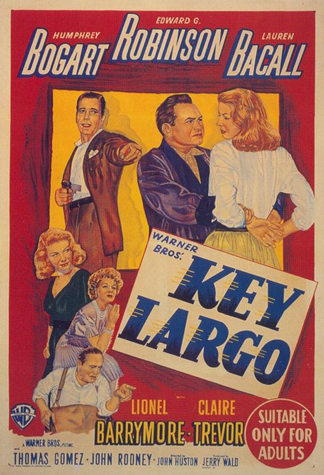 A reader at a studio, Betty criticizes Joe’s newest screenplay early in the film. 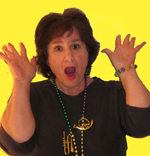 Viewers later learn that she is harsh because she believes he has potential. The two end up collaborating on a screenplay late at night when Norma is asleep. Betty says she wants to work on the screenplay because she is ambitious, but she doesn’t want to work on it without Joe, with whom she is obviously smitten. She is presented as the anti-Norma, young and interested in promoting Joe (a traditional feminine attitude) rather than herself. She allows herself to be kissed by Joe rather than reaching out to grab him as Norma does. Norma says she is in love with Joe, but she wants him to bolster her ego and her career; his career is of secondary interest to her (if it is of interest at all). When the young me watched Sunset Boulevard, she asked all the “what if” questions about Joe that the film encourages: what if Joe had gotten away from Norma; what if he had become a good, honest screenwriter; and so forth. I saw Sunset Boulevard again in a film class when I was in my early 30s, as part of a discussion of classical Hollywood narrative. I found myself crying at the picture’s end. 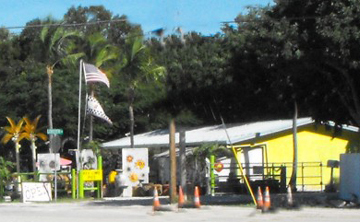 I wasn’t crying for poor dead Joe, however. I was crying for poor live Norma. And I cry for her now each time I see the film. Betty’s major appeal is that she is 22 years old. Anybody can be 22—or at least, just about everybody is 22 at some time or other. Norma is hardworking, talented (she is luminescent in the scenes from her silent-film work projected in her living room, real footage of Swanson in the unfinished film Queen Kelly), and barely middle aged. The scene in which she sails in to the Paramount Pictures lot to confer with her former director, Cecil B. DeMille, is touching. 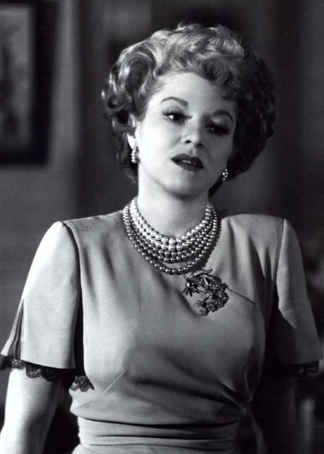 She meets several of the “little people” with whom she used to work—a security guard, an electrician, a hairdresser—and one gets a sense of what the young Norma Desmond might have been like. 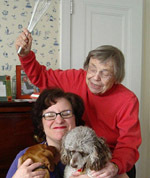 The older Norma may have lost some of her wit(s). She still has a lot of courage, if not quite enough to face what has become of her stardom and her audience. And she exhibits all too much heart. It’s a tribute to the power of film—to the power of a good film, anyway—that I can relate to different characters and different storylines at different ages. Perhaps when I’m 65 or so I’ll identify with Max von Mayerling, Norma’s butler, who is also her ex-husband and former film impresario. 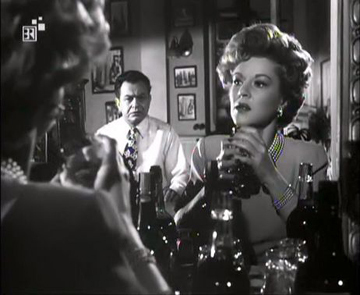 In a sense Max is the most selfless person in the film, since he lives only to give Norma Desmond what she wants. Or maybe I won’t identify with him. I’ve never been completely selfless. 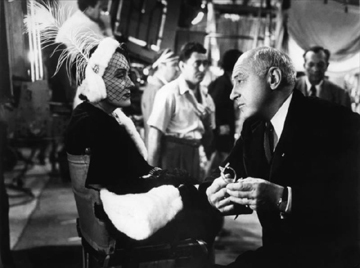 Moreover, it’s hard not to remember that Max is played by Eric von Stroheim, whose reputation went a little overboard in the NON-selfless direction. We’ll see how the film strikes me when I hit 65. In any case, I urge readers to watch the film again (or for the first time) and tell me whom they identify with. I thought long and hard about recipe choice for this post. 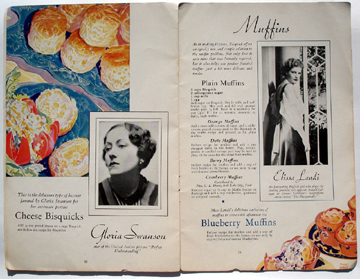 I might have selected something organic and vegetarian; Gloria Swanson was a noted health-food enthusiast and an early proponent of local, organic foods. 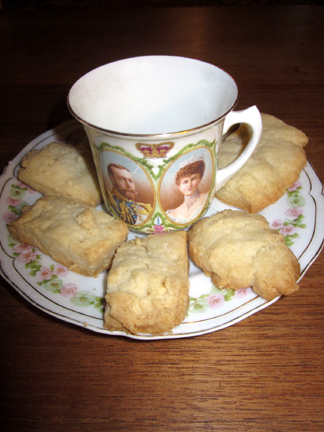 I almost made the biscuits in this 1933 recipe (if you can call it that;it’s just cheese added to biscuits), which a Bisquick recipe booklet claimed was a Swanson favorite. In the end I decided to honor Film Noir as a whole with a Valentine’s Day adaptation of the classic Icebox Cake. One if the visual signatures of many films noirs is a series of bars across the screen (often across actors’ faces) that symbolize the shadows that hover over the doomed characters, and the prisons that many film-noir protagonists create for themselves. 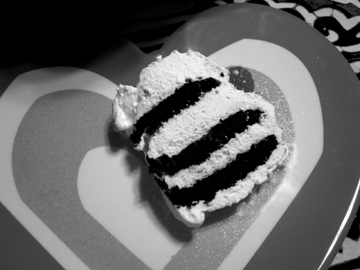 When sliced at an angle, icebox cakes create lovely black-and-white lines that evoke the bars. 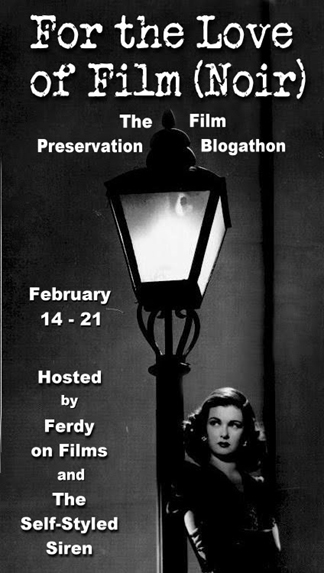 You can follow the growing tally of participants in this blogathon by checking out the lists at Ferdy on Films and the Self-Styled Siren. And PLEASE don’t forget to donate to the Film Noir Foundation! Whip the cream until stiff peaks form. Fold in the vanilla and liqueur. Gently crush 2/3 of the raspberries and fold them carefully into 1/2 of the flavored whipped cream. Reserve the remaining whipped cream. Spread about 1-1/2 tablespoons of the raspberry/cream mixture onto a wafer. Top it with another wafer. Stack them standing up until you have 9 or 10 wafers; then gently lay the stack on its side on a serving plate. Repeat, adding to the horizontal stack, until you have used up the remaining wafers. Cover the log of stacks with the remaining whipped cream. Refrigerate, gently covered, for at least 4 hours. Remove from the fridge just before serving and garnish the torte with the remaining raspberries. Slice diagonally so that black-and-white bars appear. Nabisco’s original recipe says its cake serves 14; in my family, it served 8 to 10. 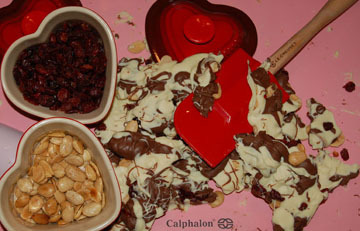 I was making chocolate bark on Tuesday for a couple of my long-distance Valentines when I realized that I had never posted my bark recipe on this blog. The omission HAD to be rectified! Chocolate bark is one of the easiest and most popular gift treats in my kitchen. 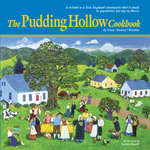 I was given the recipe by my neighbor in Hawley, Massachusetts, Philip Keenan. Phil is a selectman, a chef, and a builder—and he’s good at all three jobs. I made the bark a few years back on a Valentine’s Day broadcast on my local public-radio station. Feel free to vary this recipe. Tiny jelly beans make nice filler at Easter, and crushed candy canes are Christmas-y, but the cranberries and almonds are my favorite add-in. As I said on the broadcast, I recommend using the highest quality chocolate you can get. If you can’t handle three double boilers, just use two kinds of chocolate as I did in the picture below and on the radio. Do not double the recipe unless you have two cookie sheets. I tried doing it on one sheet this week. Although I’m sure my Valentines won’t complain (well, I hope they won’t complain) I thought the layer of chocolate was too thick for optimal flavor and texture. Butter a cookie sheet. Place the almonds on it, and toast them in a preheated 350-degree oven for 8 minutes. Toss the almonds around on the sheet, sprinkle the salt on them, and toast for an additional 2 minutes. Remove the nuts from the oven, and put them on a paper towel to drain and cool. When they are cool, sprinkle them on a parchment- or silicone-covered cookie sheet. Sprinkle the cranberries on as well. In each of three separate double-boiler pans (or their equivalent), boil an inch or two of water. 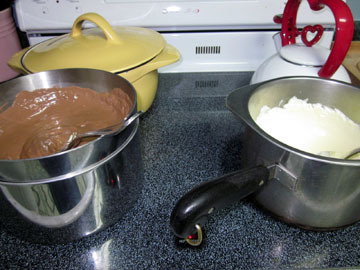 While the water is coming to a boil, separately chop the milk, dark, and white chocolate into fairly uniform pieces. Place each chocolate in a pan on the top of one double boiler, turn off the heat below the boiled water, and stir the chocolates as they melt. 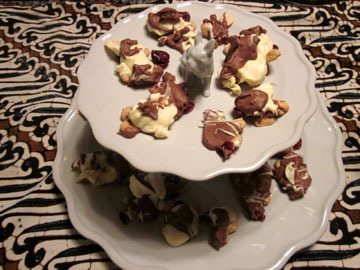 When the chocolates have melted, place alternating teaspoonsful of each on top of the cranberries and almonds. Swirl or splatter them together to make a pleasing pattern. Set the chocolate aside to cool and harden. (Do not refrigerate it.) This is best when eaten within 48 hours. Makes 16 large or 32 small pieces of bark.